When you market to a B2B, you will realize that businesses work hard to streamline the buying process to save time and money. 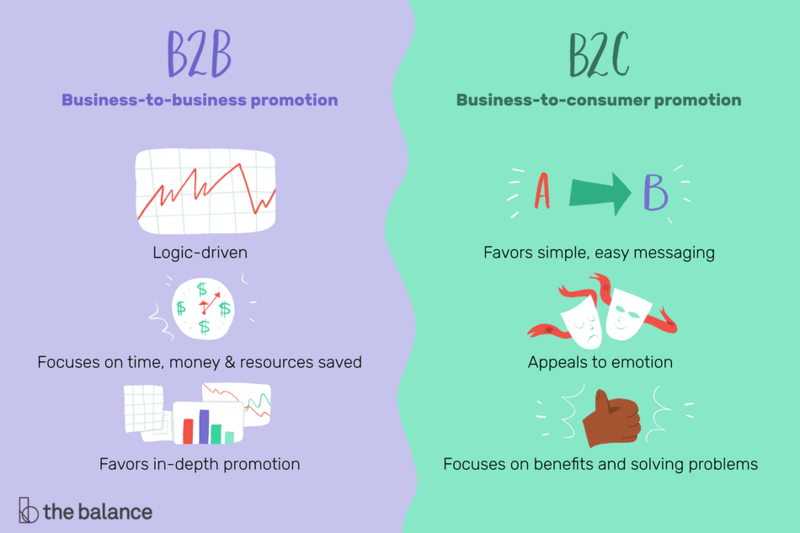 It often explains why a B2B purchase is based more on logic and why a consumer's purchase often is based more on emotion. It is true that the cost of a sale for the B2B market can be more expensive than the B2C market. The easiest way to explain this is that a B2B transaction often takes more consideration, involves more people, and requires more decision makers. B2B clients often need to prove a return-on-investment for their purchase. In B2B marketing, you want to focus on the logic of the product and its features. There is little to no personal emotion involved in the purchasing decision, so you want to focus on understanding your buyers and how they operate within the confines of their organizations' procedures. What's their role? What's important to them? This type of marketing is about people using the product more than it is about the product itself. Be more in-depth with your marketing materials. Your most effective messages will focus on how your product or service saves time, money, and resources. What kind of return on investment can buyers expect with their purchase? As an example, imagine that your company sells productivity software. If you are marketing it to businesses, the key thing you need to be able to show your prospective clients is that using the software will save them money in the form of time. Because those using the software will be able to streamline their work through the use of your software, employees will be able to get more done in the same amount of time. Because this likely would be a significant purchase for most companies requiring multiple software licenses and adequate training, expect the sales process to involve detailed demonstrations and trial periods. When you are marketing to a consumer, you want to focus on the benefits of the product. Their decision is more emotional. Consumers also are different in that they demand a variety of distribution channels for convenience. Consumers are less likely to be interested in a lengthy marketing message and want you to get right to the point. Consumers don't want to work to understand your benefits. Instead, they will want you to point out the benefits to them clearly. With consumers, your message must be simple and easy to understand. Consumers also have a much shorter purchasing process than businesses. They can purchase within a few minutes to within a few days. Your most effective marketing strategies will focus on the results and the benefits that your product or service will bring to them. Customers will want to hear more about how a product or service helps them and what benefits it brings to them personally. Focus on the problem or pain point that you solve. Consider again the example of the productivity software. What consumers will want to know is how the software is going to make their lives easier. If it includes a calendar feature, how is inputting information easier, and how does it sync with family members' phones and laptops, etc.? Your customers in this example aren't looking for a return on their investment. They're simply looking for software that will make their lives easier without being too complex.